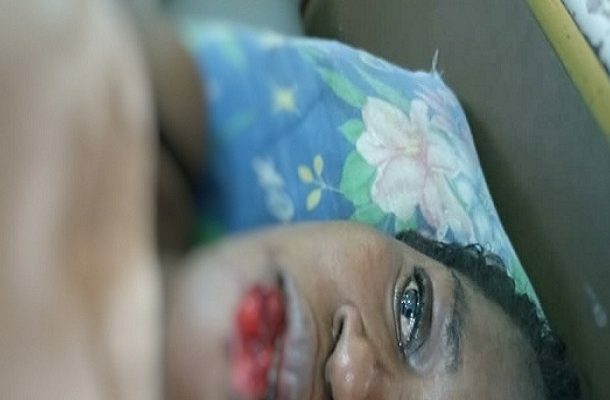 A jealous girlfriend in Takoradi has completely bitten off the lower lip of another lady she suspected of having an affair with her boyfriend. The newly trained nurse who did not understand why her boyfriend gave lift to the 23-year-old hairdressing apprentice, pursued the victim to her house and in cannibalistic manner, bit off her entire lower lip. The lady, Beatrice Eric Agyapong was immediately rushed to the Kwesimintsim Government Hospital but doctors on duty said the cells in the bitten off part had died, hence could not stitch it to the mouth. Beatrice who has been on admission since Friday when the incident happened, told Takoradi-based Connect Sunday that the matter has been reported to the Police but the perpetrator is yet to be arrested. She said she has been groaning in pain. According to the victim, she was recently treated for ulcer and was thus advised by doctors to adopt the habit of eating early to avoid complications. On Friday at about 8:00am, she decided go to Kwesimintsim to find food to buy and just when she stepped out of her house, she saw a private car passing so she flagged it to stop. Beatrice said she pleaded with the driver of the car, who turned out to be the boyfriend of the suspect, to give her lift to Kwesimintsim which he obliged. “I saw the private car passing and pleaded with the driver to alight me at Kwesimintsim so I could find some food to buy,” she recounted. She explained that just when she got back home and about to eat her food, the nurse whose name has only been given as Mummy, suddenly showed up and confronted her [Agyapong] about why she boarded the boyfriend’s car. “She grabbed my lip and started chewing it as I struggled to defend myself but to no avail,” she told Connect FM. The victim said people intervened and rushed her to hospital and doctors on duty sent for the bitten off flesh but the time it was brought, they said all the cells in it had died so could not be stitched. Asked whether she had any issues with the suspect, Beatrice responded in the negative, adding she had not even spoken with her before though she knows the nurse as a tenant in her (victim’s) uncle’s house. A report has since been made to the Kwesimintsim police who are waiting for the victim to feel a little better to take a statement from her.